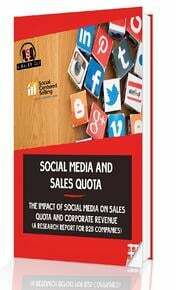 Does social media impact sales quota and corporate revenue? The Social Media and Sales Quota Survey says "Yes!" and the data is compelling. 72% of salespeople using social media as part of their sales process outperformed their peers and exceeded quota 23% more often. There's a direct correlation between closed deals & social selling tactics: 54% of survey respondents have tracked closed deals to engagement on social media. ce leasing advice. A few months after that we had a signed lease in a building I represent. All because of one tweet. @CarlMuhlstein, Managing Director, Jones Lang LaSalle, IP, Inc.
Get Your Social Report Now!